We have learnt with great sadness the news about the passing away of Dr. Gamani Corea on 3 November 2013. Dr. Corea, a Sri Lankan, was one of the most eminent economists of the developing world, having been educated at the University of Ceylon, and the Universities of Cambridge and Oxford, and obtained his doctoarte at Oxford. He had been the Permanent Secretary of the Ministry of Planning and Economic Affairs and Senior Deputy Governor of the Central Bank of Sri Lanka as well as a distinguished diplomat for his country. He is best known as the Secretary-General of UNCTAD in 1974-84, in which capacity he led the multilateral efforts to strengthen the position of developing countries in various areas, including in commodities and other areas of trade and development, and in the efforts in establishing a new international economic order. He was a great contributor to the cause of the South and to South-South cooperation. He played a significant part in the founding of the Group of 77 developing countries in 1964 and continued to be a great support for the G77 and China throughout the years, including during his term as Secretary General of UNCTAD. He also assisted the Non Aligned Movement (NAM) in various capacities. Dr. Corea was a major leader in the establishment and development of the South Centre, including being a Chairperson of the Board. Dr. Corea was a member of the South Commission (1987-1990), member of the Board of the South Centre (1995-1998), Chairman of the South Centre’s Policy and Research Committee (1998-2001) and Chairperson of the Board in 2002-2003. He provided immense intellectual and personal support to His Excellency Julius Nyerere, Chair of the South Commission and the South Centre (and former President of Tanzania) until his passing away in 1999. Dr. Corea played a leadership role in directing and supervising the work of the South Centre in the various capacities through the years. 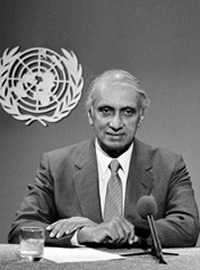 Among his responsibilities, he chaired the South Centre’s Group of Experts on Financing for Development (2001), and prepared a paper which was submitted to the Group of 77 to assist it in its participation in the work of the Preparatory Committee for the UN Conference on Financing for Development. He has chaired the NAM Ad Hoc Advisory Group of Experts on Debt (1993-1994) and the NAM Ad Hoc Panel of Economists (1997-1998), submitting its report to the XII Non-Aligned Movement Summit held in 1998 in Durban, South Africa. With his passing away, the developing countries have lost a great champion and the world has lost a tireless leader in fostering international cooperation. He is leaving behind a rich and valuable legacy that will continue to be of benefit for the people of the South and the world for many years to come.